Arnott Maxwell Fernie, organist: B Wellington, April 25, 1910; m (1) Meriel Hunn (diss) 1d, (2) Grete De Brabander 1d 3s; ed Marist Bros PS(Newtown), Wgtn Clg, Royal Acad Music (Lond); mil serv NZEF; chr mstr St Joseph’s (Wgtn), Aeolian Choir, Rosary Church (Lond), dir music RC schools (Wgtn archdiocese) 1950-53; organist Westminster Cathedral (Lond_ 1953-58, dir music St Mary of the Angels (Wgtn) 1958-1999; organ tutor VUW 1963-88; fdr 1967&dir Schola Polyphonica; city organist (Wgtn) 1972-1999; Cross Ecclesia et Pontifice 1989, OBE (music) 1974; d. Wellington May 22, 1999. Max Fernie was a fixture of Wellington music. For many Wellingtonians there would scarcely seem to be a time when he wasn’t part of the city’s choral life. He shooled choirs, conducted them in recital and concerts, he accompanied them, he taught piano and organ, and he performed alone. He was city organist for 27 years, played the Town Hall’s massive pipe organ in dozens of recitals, and supervised its restoration. His favourite, however, was the smaller but infinitely superior organ built to his design at St Mary of the Angels In Boulcott St. Fernie, the organ and St Mary’s were an uncanny and wondrous match. 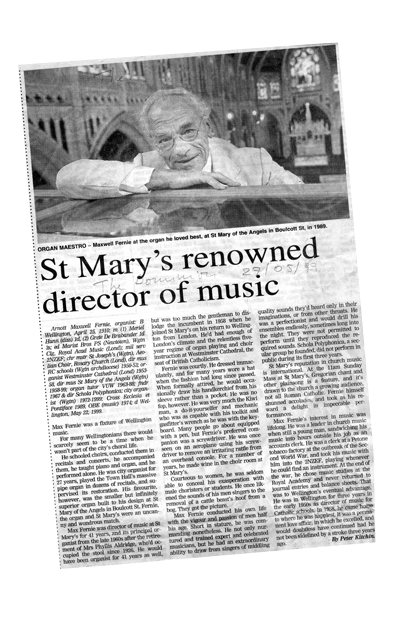 Max Fernie was director of music at St Mary’s for 41 years, and its principal organist from the 1960s after the retirement of Mrs Phyllis Aldridge, who’d occupied the stool since 1926. He would have been organist for 41 years as well, but was too much the gentleman to dislodge the incumbent in 1958 when he joined St Mary’s on his return to Wellington from London. He’d had enough of London’s climate and the relentless five year regime of organ playing and choir instruction at Westminster Cathedral, the seat of British Catholicism. Fernie was courtly. He dressed immaculately, and for many years wore a hat when ethe fashion had long since passed. When formally attired, he would occasionally draw his handkerchief from his sleeve rather than a pocket. He was no fop, however. He was very much the Kiwi man, a do-it-yourselfer and mechanic who was a capable with his toolkit and gasfitter’s wrench as he was with the keyboard. Many people go about equipped with a pen, but Fernie’s preferred companion was a screwdriver. He was once seen on an aeroplane using his screwdriver to remove an irritating rattle from an overhead console. For a number of years, he made wine in the choir room at St Mary’s. Courteous to women, he was seldom able to conceal his exasperation with male choristers or students. He once likened the sound of his men singers to the removal of a cattle beast’s hoof from a bog. They got the picture. Max Fernie conducted his own life with the vigour and passion of men half his age. Short in stature, he was commanding nonetheless. He not only nurtured and trained expert and celebrated musicians, but he had an extraordinary ability to draw from singers of middling quality sounds they’d heard only in their imaginations, or from other throats. He was a perfectionist and would drill his ensembles endlessly, sometimes long into the night. They were not permitted to perform until the reproduced the required sounds. Schola Polyphonica, a secular group he founded, did not perform in public during its first three years. St Mary’s reputation in church music is international. At the 11 am Sunday Mass at St Mary’s, Gregorian Chant and other plainsong is a feature and it’s drawn to the church a growing audience, not all Roman Catholic. Fernie himself shunned accolades, and took as his reward a delight in impeccable performances. Max Fernie’s interest in music was lifelong. He was a leader in church music when still a young man, sandwiching his music into hours outside his job as an accounts clerk. He was a clerk at a Petone tobacco factory at the outbreak of the Second World War, and took his music with him into the 2NZEF, playing whenever he could find an instrument. At the end of the war, he chose music studies at the Royal Academy and never returned to journal entries and balance sheets. That was to Wellington’s eventual advantage. He was in Wellington for three years in the early 1950’s as director of music for Catholic schools. In 1958, he came home to where he was happiest. It was a permanent love affair, in which he excelled, and would doubtless have continued had he not been sidelined by a stroke three years ago.